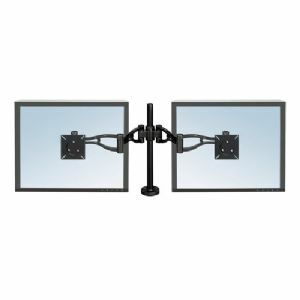 Accommodate the largest and heaviest monitors up to 24lbs weight capacity with the use of the Fellowes Professional Dual Monitor Arm. It comes with a full 360-degree range of rotation that meets VESA mounting standards and fully adjustable for optimum viewing comfort. It has the perfect height and angle to reduce eye, neck and back strains and with its strong durable construction, it can withstand the rigors of a busy day providing enhanced stability using its low profile, weighted base. Buy the Fellowes Professional Dual Monitor Arm now! 22" x 4.38" x 38.75"